Pretzels. French fries. Potato chips. Margaritas. Steak. Tomatoes. 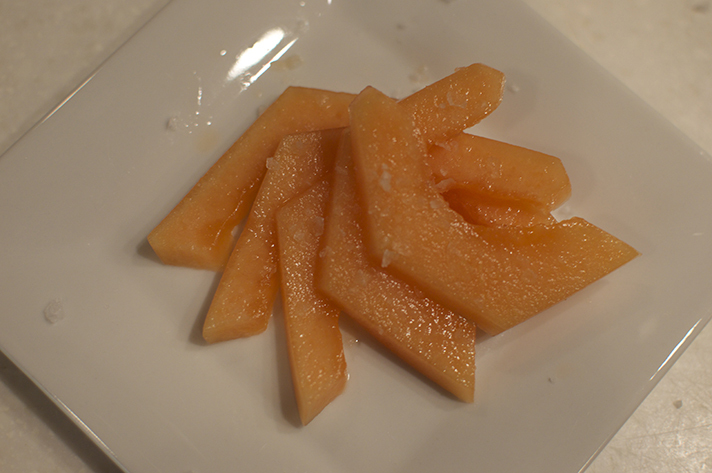 Watermelon. Buttered bread. What do all these things have in common? They’re all crap without salt. People get upset about salt. Oh, no more salt for me. Doesn’t that contain a lot of salt? Aren’t you using too much salt? Yeah, yeah, okay. Sodium can definitely be a problem — a real, empirical health problem. If you have high blood pressure, if you retain water, if you get easily dehydrated, you know that sodium is an important dietary component to keep in mind. But salt is not evil. Salt is glorious. It brings out natural flavors in foods, making lemons more lemony and chicken more chickeny. Just like soap breaks the surface tension of water to allow the water to clean things better, salt opens up your taste buds to allow you to taste things better. It also keeps food from spoiling. But because it keeps food from spoiling, it’s over-used in processed foods as a preservative. So if you’re worried about your salt intake, be worried about your processed food intake, not about the salt you use to season the foods you cook in your own kitchen. Cooking for yourself means using salt is okay. And using canned foods or high-sodium condiments can be okay too, in moderation. For example, rinsing canned beans with water, then draining reduces their sodium content by about 40%. And often the amount of high-sodium condiments used in a recipe, divided by 4-8 people, is inconsequential. So if you’re using 2 tablespoons of (sodium bomb) miso paste on your broiled fish, on 8 filets for dinner, you’re not really consuming the 1000mg of sodium found in those two tablespoons. Divided by 8, you’re looking at a very reasonable 125mg sodium from that paste. If a super-salty condiment will contribute flavor beyond belief, it’s probably worth the sodium splurge. 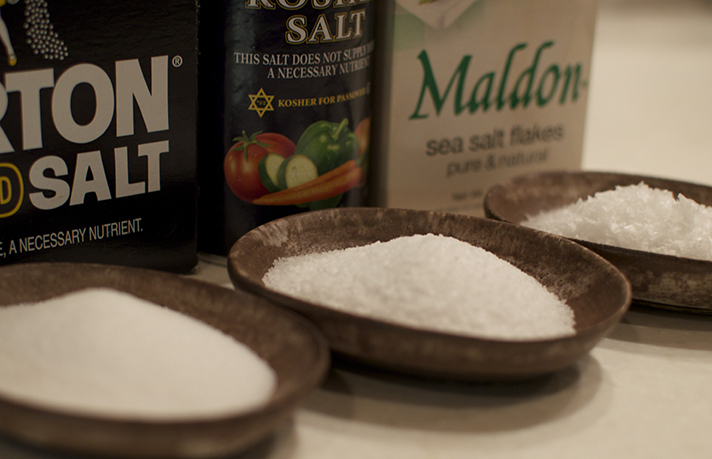 I regularly use three types of salt in my kitchen: iodized, kosher, and Maldon. Chefs tend to be a little snooty about iodized salt, but it’s cheap and it’s still salt, so I use it for salting water for boiling pasta and potatoes, and for blanching veggies. Kosher salt is used for almost every other purpose, from rubbing on meats before grilling to seasoning vinaigrettes. It’s about half as salty by volume as iodized salt, because the grains are larger and flakier. Tiny, round iodized salt tends to bounce off of foods instead of clinging to them; kosher clings, thus making it ideal for seasoning. The last kind, Maldon, is a brand of English sea salt perfect for garnishing. I use it to top caramel sauces, salads or just warm buttered bread. It’s especially nice to dress up veggies that usually don’t get a lot of time in the spotlight. For example, radishes, dipped in softened butter, then Maldon: absolutely amazing. 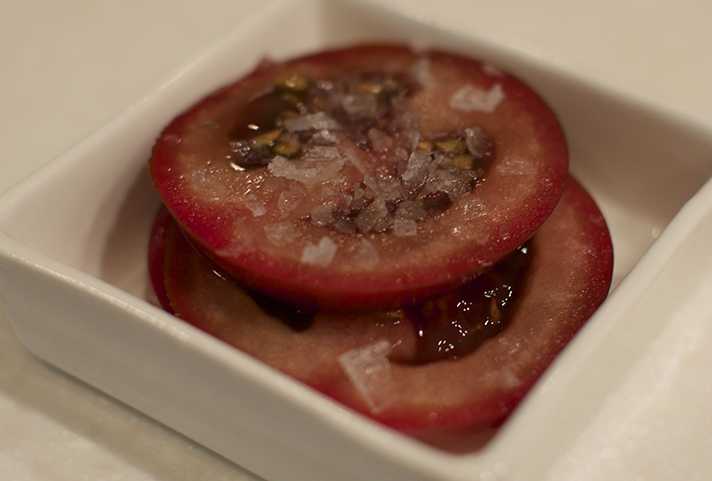 Cherry tomatoes, dipped in vodka, then Maldon: a revelation. And it does wonders for melons. Mmm, Maldon. Give it a shot, and remember, any time you make your own food, you’re taking control of your health. When you know what you put in your food, you can make more informed decisions about what to leave out.